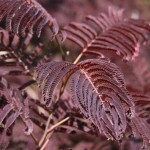 A wide spreading tree with finely cut, chocolate burgundy foliage. It has bright pink "powder puff" blooms in the summer. It is tolerant of drought and high pH soils, preferring average medium moisture, well-drained soils. The best flowering will occur in full sun. It was found as a chance seedling in Japan in 1990. PP 13,822.